Add Aluminium Residential Doors like these to your home. We install Aluminium Residential Doors across Bournemouth, Southampton, Portsmouth, Salisbury, Fareham, Hedge-End and surrounding areas. These doors secure a standard of door that goes above and beyond. With one of our aluminium doors installed into your home, you’ll be able to make your home a safer and more comfortable place to be across the course of the year. For your peace of mind, all of our aluminium doors are able to achieve the latest standards of thermal efficiency, security, durability, weather proofing, performance, and aesthetic. They achieve this by utilising an industry-leading aluminium profile that has been designed to meet the demands and expectations of the modern age, refined over the years to offer you a cutting-edge aluminium door option. Due to their versatility, our aluminium residential doors can be fitted in a wide range of property styles. They are available in a wide range of colours, finishes, and formats to help you bring the ideal complement to your property. It won’t matter if your home is modern, traditional, period, heritage, or new build, we’ll be able to offer you a standard of door that will suit both your existing architecture and personal tastes. When the aluminium residential door design was in its infancy, it was unable to meet the thermal efficiency performance of their uPVC counterparts. However, modern innovations enable us to offer an aluminium door design that comprises a thermally broken profile. In turn, this means that the warmth from your central heating will stay in your home for a longer period of time and you’ll be able to keep the winter winds at bay. Increasing the heat retention of your property does more than just increase your comfort, it could also help you to save money too. This is made possible by helping you to lower your reliance on your central heating to keep your home at the right temperature. As a consequence of this, you could find yourself with a lower annual heating bill: while also reducing your carbon footprint at the same time! These doors will be able to bring more to your home. The aluminium residential doors that we offer are highly secure by design, offering you the benefits of a PAS23/PAS24 upgrade to help secure peace of mind further. They comprise a design that has been approved by Secured by Design, a police-backed initiative that has been devised to help ‘design out crime’ when it comes to the home improvement sector. With this in place, you’ll be able to protect your home against modern burglary trends. This standard of security is achieved through the combination of premium grade materials and intelligent installation techniques. Although slim and sleek in their appearance, our aluminium residential doors uphold an impressive degree of structural integrity. Further to this, all of the doors that we offer are fitted with high-security, multi-point locking systems that engage at multiple points of the frame to ensure security is kept consistent. A major benefit of the aluminium design is the ability to accommodate an extensive colour range for you to choose from. From the full RAL spectrum through to traditional woodgrain foils, our aluminium doors can be decorated to suit both your home and your tastes. You can even capture a timber door look without the maintenance headaches. All of our aluminium residential doors are manufactured using high-grade aluminium, which means that they will require very little input from you to ensure they look and perform at their very best. All you will need to do is give them a quick wipe down with a damp cloth, and you won’t have to worry about any rotting, warping, discolouring, or cracking when the door gets wet. 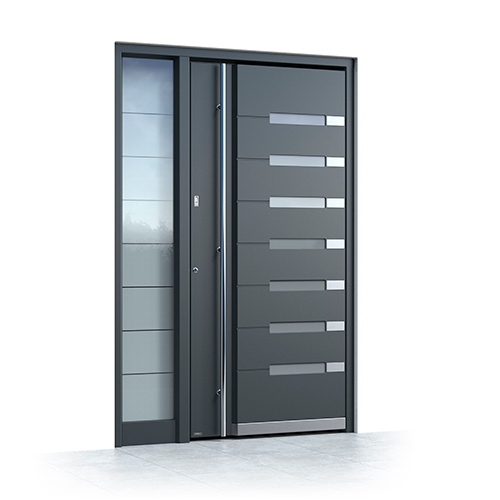 Due to the inherent strength of aluminium, all of our aluminium doors are able to achieve a slim and sleek frame. This is achieved without compromising on the strength of the door, so you can enjoy the best of both worlds. Further to this, it also enables these doors to achieve a generous glazed area that will enable them to make any room brighter as a result.